Medela - Breast Milk Bottles are light, unbreakable bottles, that are ideal for collecting, storing, transporting, freezing and feeding breastmilk. They can be used for long-term hygienic and safe storage of breastmilk. Storing your breastmilk in a Bisphenol-A free bottle ensures the maximum safety for your baby's health. 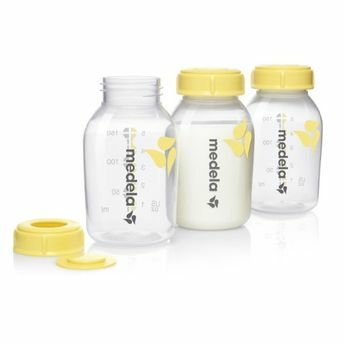 Additional Information:Medela was founded in 1961 by Olle Larsson and is headquartered in Switzerland. Medela is now a global player in breastfeeding products; all this thanks to continued research, innovation and the evaluation of customers' needs. They promote breastfeeding for mums for bettering the health of both mother and child. Medela offers a variety of breastfeeding products to meet every mom'ss needs. They offer a wide range of breastfeeding accessories and spare parts that support and enhance the breastfeeding experience. Kit Includes: 3*150ml Storage Bottles.